DETROIT – Great time for the best win of the year. You could argue about the “best win” part, though it was certainly the most lopsided – a 26-point thrashing of a Denver team that began the night with a 37-15 record atop the West. You can’t argue about the propitious timing, though. Coming off of the psychological battering of losing on Saturday to the Clippers after holding a 23-point lead with 17 minutes to play, the Pistons were in dire need of something to salve their wounds. Drummond was at the heart of the dominance, right there with a bench unit that turned a 180 after a dreadful outing on Saturday when it was outscored 80-17. Drummond finished with 27 points and 12 rebounds, roundly outplaying Nuggets All-Star Nikola Jokic. 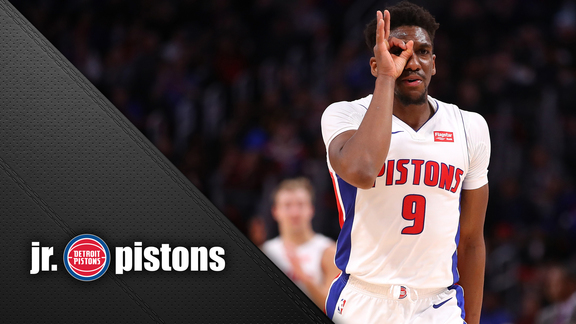 In the third quarter alone, Drummond produced 10 points off of offensive rebounds – four put-backs and two free throws. Drummond put up zeroes in the fourth quarter only because he didn’t play. Neither did any other starter. That was a second important reason why the timing of this resounding win was so critical. Stanley Johnson, Langston Galloway and Luke Kennard all scored in double figures off the bench. Johnson’s 21 points included a 4 of 5 night from the 3-point arc. Galloway added 18, Kennard 14. The bench hit Denver with a 12-0 run to start the second quarter, giving the Pistons the lead for good. And they hit the Nuggets with a 12-2 run early in the fourth quarter to stretch a 14-point lead to 24 and chase away all fears of a Saturday repeat. Denver was missing starters Jamal Murray, Gary Harris and Paul Millsap, but the Nuggets have gotten superb play from the likes of Malik Beasley and Monte Morris, a Flint native who had a large turnout of supporters at Little Caesars Arena. And they got the Nuggets off and running as they sprinted to a 25-18 lead just five minutes into the game. Morris scored 11 first-quarter points, Beasley nine as the Nuggets hit their first four 3-pointers. But Casey got a timeout and immediately the game began to turn. After scoring on 10 of its first 11 possessions, Denver didn’t score on five straight as the Pistons began to take control. The Pistons set a season high with 32 assists and shot a season-best 54.5 percent. They scored 29 points in the third quarter, the only thing that kept them from four 30-point quarters. Remarkable how different everything felt 48 hours after a loss Casey aptly called “devastating.” With Ish Smith back from injury, the bench responding to his lead and Reggie Jackson continuing a marked ascent – he had 14 efficient points in only 22 minutes, another beneficiary of the bench’s big night – the Pistons headed to the Big Apple with a bounce in their step.